More than 200 species of squirrels inhabit Earth, but only three live in Germany. The European red squirrel (Sciurus vulgaris) is a tree squirrel, native to Germany. The eastern gray squirrel ( Sciurus carolinensis), is an American tree squirrel who lives in Germany but is not native. The European ground squirrel (Spermophilus citellus), native to Germany, lives in underground burrows. One feature that distinguishes European red squirrels from other squirrel species is the tuft of fur around their ears, hence their nickname "tufties." Red squirrels are small, only about 7 to 9 inches long. European red squirrels construct nests called dreys, hollow balls of sticks and leaves. They often build multiple dreys for sleeping and raising their young on branches near tree trunks. The habitats of European red squirrels are forests of deciduous and coniferous trees but they also make their homes in parks or residential neighborhoods. Their favorite foods are acorns, seeds, insects, fungi, berries and bark. Occasionally, red squirrels eat eggs or baby birds. They also bury nuts and pine cones to store for eating later. Eastern gray squirrels are native to eastern North America but were introduced to Europe during the early 1900s when they were accidentally freed from the London Zoo. Gray squirrels were also introduced to Italy in the late 1800s when they were imported from America as pets. Gray squirrels now invade the homes of the European red squirrels, infecting them with viruses and causing ecological damage to trees, bird life cycles, gardens and orchards. Gray squirrels grow up to 20 inches long with 10-inch bushy tails. During the winter, gray squirrels make their homes in the hollow of trees or they manage to nest in attics or in the eaves of houses. In warmer weather, they make temporary nests out of leaves and sticks located in tree branches. The habitats of gray squirrels in Germany are deciduous and coniferous woodlands. Gray squirrels also feel comfortable in residential areas where they can find food sources. Their diet consists of acorns, nuts, flour bulbs, seeds, berries, grains, eggs and nestling birds. European ground squirrels have short legs, furry tails and bodies covered in gray and yellow fur. These ground squirrels grow 8 to 11 inches long. European ground squirrels gather roots, seeds, flowers and shoots, storing them in their cheek pouches to carry back to their underground burrows. European ground squirrels prefer grassy, open areas, such as pastures, fields and golf courses for their underground burrows. 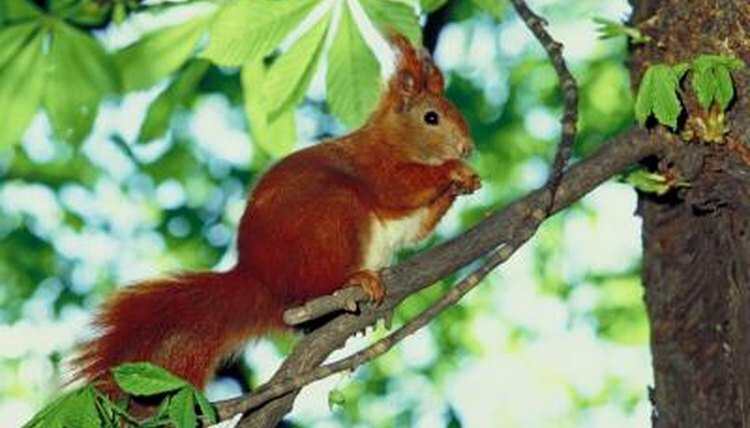 Loss of habitat and the introduction of the eastern gray squirrel into Europe threaten the red squirrel’s population, but the reds are not yet endangered. Red squirrel protection agencies in Germany help rescue these squirrels injured by predators like raptors, pine martens, red foxes and wildcats, as well as those diseased and displaced by deforestation. Predators of the eastern gray squirrel are hawks, cats, owls and fox. Humans often hunt gray squirrels for food and pelts. Threats to the ground squirrel’s habitat include farming, recreational vehicles, agriculture and ecosystem changes.